The unique monument of nature in Europe is situated at 3 km distance form Sebeş, on the road between this town and the village Daia Romana, in the north. 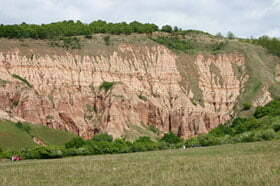 Râpa Roşie is a geologic reservation with a surface of 10 ha. Its walls are between 80 and 100 m high. The water, which digs in the hill for about 60 million years, leaves behind bizarre forms: columns, towers, pyramids, all having a reddish colour. Deep abysses open on the left and right side, and the rain water forms blood rivers, which fall down in the hollows with a sinister sound. Birds have dug in the clay tens and tens of holes. Going down towards the bridge, over the Secas river, the tunnels, dug by the rain water, unfold, which in time crumbled and formed enormous ditches. The ski domain Sureanu is another tourist attraction where you can practice winter sports on newly grounded ski slopes. The ski domain is one of the hidden touristic pearls of the area, having a picturesque natural frame and a special location. The ski domain has an extraordinary touristic potential, being withdrawn in the slope of the Sureanu Mountains. During wintertime the ski domain represents an attraction for those who practice winter sports. In the rest of the seasons the area attracts those who enjoy hiking and those who are looking for a quiet place and fresh air. These qualities are offered with generosity by Valea Frumoasei and the Lake Oasa. The distance between Sebeş and the ski slopes is of 80 km. The altitude of the ski slopes is approximately 1600 meters. 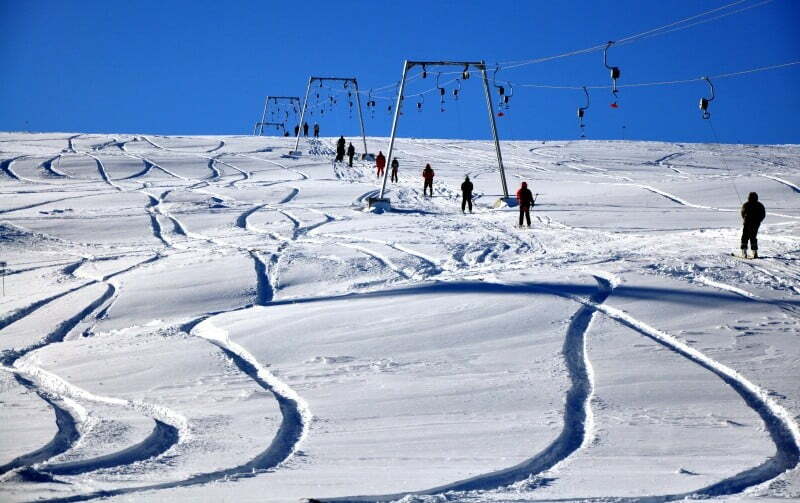 The ski domain has 7 ski slopes of different difficulties, which are between 600 and 1700 meters long, where you can ski in very good conditions. The way to the ski slope is relatively good, but during winter you need snow chains. Built during the reign of Burebista, the Fortress Capalna ceased to exist as a consequence of a great fire during the Dacian – Roman wars. Situated 18 km away from Sebeş, the Dacian fortress with stone walls dominates Sebeş valley. The road towards the fortress goes smoothly up passing the people’s yards, by the apple trees full of fruits and hay sacks that seem to be coming out of a beautiful painting, then by the edge of a forest, only to be then abruptly transformed into an ascent through a high thick forest. Being set like a hat that covers the top of the hill, the fortress offers a unique landscape interlaced with accumulation lakes and houses lodged by the locals.